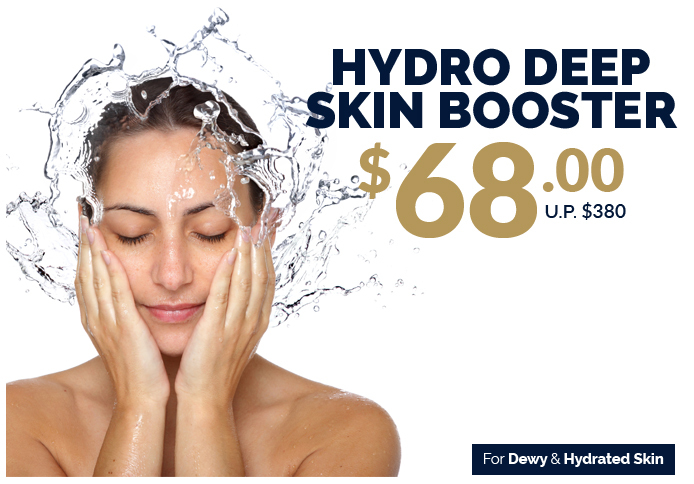 HYDRO DEEP SKIN BOOSTERS 水光微针 rejuvenates the skin from inside, it restores the skin's hydro balance, improving your skin elasticity, texture, smooth wrinkles, fine lines and soften scars; Creating a youthful lustre and glow. Hyaluronic acid and a boost of special ingredients with polysaccharides specially formulated by our team of medical professionals are used during the treatment to hydrate the skin and minimize fine lines. Polysaccharides and Hyaluronic acid are responsible for the skin's natural ability to hydrate and it can retain up to 1000 times of moisture. The treatment promotes the natural reproduction of collagen and elastin; making the skin smoother and tighter. Creating only microscopic punctures in the epidermis, Hydro Deep Skin Booster is minimally invasive with little damage to the epidermis which means the collagen production is significantly quicker than some other more aggressive treatments. This treatment is performed with a surgical grade instrument with stainless steel micro needles ranging from 0.5mm to 1.5mm in length. It is suitable for all skin types and all areas of the face, neck, décolletage and hands. WHAT SKIN TYPES ARE SUITABLE FOR THIS TREATMENT? The results are gradual as collagen re- production takes time, most clients report a gradual improvement in their skin colour and texture over 6- 8 week period. That improvement is compounded as each consecutive treatment is performed. So it's really important to apply creams at home and commit and rebook your treatments to see the best results. The inflammatory reaction of the skin is extremely short and fades significantly within hours from the redness to pinkish that may last for 12 to 24 hours on average. Most clients are able to return to work the same day. It is important to protect the skin with sun screen SPF30+.